BsnTech Networks received an inquiry from Dee Ann Summers, owner of Just Yesterday Boutique, over the weekend. We called her back within a couple of hours and discussed her website needs. Dee Ann Summers has a small consignment / resale shop and also provides personal shopping and fashion consulting services. She also has an eBay store that is successful. Because of all the businesses she is in, she wanted to have a website that would link to her eBay store, her social networking pages, and provide details about how to contact her and the services she offers. Upon getting the information from Dee Ann, we had her website done within 48 hours! Dee Ann was very surprised at how quickly we got her website up and running – and how easy it was to have a website designed. We appreciate the business from Dee Ann! 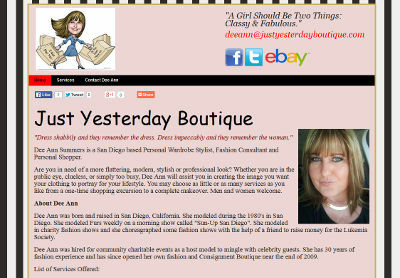 The Just Yesterday Boutique website is at justyesterdayboutique.com.